Yesterday's post about the recent Montana fires brought to mind some advice that I frequently give myself, but that I don't follow anywhere near as often as I should. The advice is simple: look at the things around you, and take pictures ... because those things might not be around forever. I think of that every time I drive old US 10 down through the Jefferson River Canyon. A little ways east of Cardwell there's a spot called LaHood, where there's a fading motel and a couple of other buildings ... but there's also a foundation, all that remains of the hotel building that's depicted in the old postcard below. 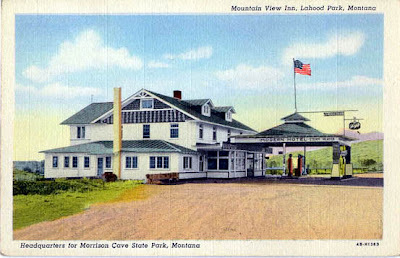 The "Mountain View Inn" was built in 1928, and served transcontinental travelers on Highway 10, as well as tourists headed to Morrison Cave -- the place now called Lewis & Clark Caverns. The coolest part of the hotel wasn't visible in the postcard, but I remember it very well ... though the gas pumps had long been shut down, you could still drive under the little canopy and gaze up at the underside of the roof. There, you'd see a fairly-amazing set of hand painted murals, depicting the caverns and an assortment of other must-see sights along US 10. I loved doing that. And then in 2001, without warning, the whole place just burned to the ground. For years, I had never gotten out of the car to look at the murals more closely, and I never took a picture ... and now every time I drive by the spot I wish I had. I was accidentally there when the Red Bluff Ag Experiment Station burned down in the summer of 2009. I was coming back from Virginia City to Bozeman on a hot Saturday in July and planned to stop at Red Bluff to check out the building I'd so often sped by. You could see a column of smoke from Norris, and by the time I got to Red Bluff it was totally engulfed. I'll email you the photos. I wish I could upload them here. It was one of the worst things I've ever been on scene for. I just wanted to say thanks, Courtney, for sending the photos. They're really spectacular shots ... it's too bad they had to be of such a tragic event.